Are you stumped about holiday gifts for your friends or family who “have it all”? Do you have friends who would appreciate a gift of charity? If so, consider ColoradoGives Giving eCards. These electronic gift cards can be purchased on the website ColoradoGives.org and e-mailed to friends and family with your personal message. 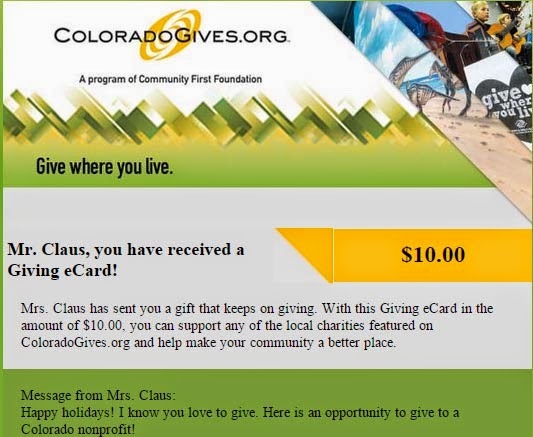 Recipients redeem the eCards by donating to any of the 1,600+ Colorado nonprofits featured on ColoradoGives.org. They are sure to find a cause they care about. Purchase the Giving eCards on Christmas eve or Christmas day for a super-timely delivery.